Baking salmon in aluminum foil packets makes it possible to flavor individual portions separately and the packets help ingredient flavors infuse into the salmon as it cooks. You can, however, cook flavorful salmon in a variety of ways without foil. Generally speaking, cook salmon for no more than 10 minutes by most cooking methods for a moist, correctly cooked piece of fish, according to the Original Fish Company. The top heating element works as the broiler in most oven models. To broil salmon, pat your fillet or steak dry with a paper towel to remove any excess moisture. Brush both sides of the salmon with your cooking oil of choice and season the fish with salt and pepper. You can also brush the top of the salmon with a blend of honey, soy sauce and lemon or orange juice for a sweet coating. Place the salmon in a lightly oiled baking pan or on parchment paper for easy clean up after cooking. Preheat your broiler to medium heat. Place the salmon under the broiler, about 6 inches below the heating element, and broil it for four to seven minutes. Check the salmon for doneness -- like most fish, salmon separates into flakes when done. You may wish to cook other ingredients separately as broiling delicate items like fresh herbs and thin slices of vegetables causes them to burn. Baking salmon takes a bit longer that broiling it, but the technique is basically the same. Season the salmon with salt, pepper and other flavorings such as fresh or dry herbs. Place the salmon in a lightly oiled baking dish or line the baking dish with parchment paper to avoid a mess to clean after baking. 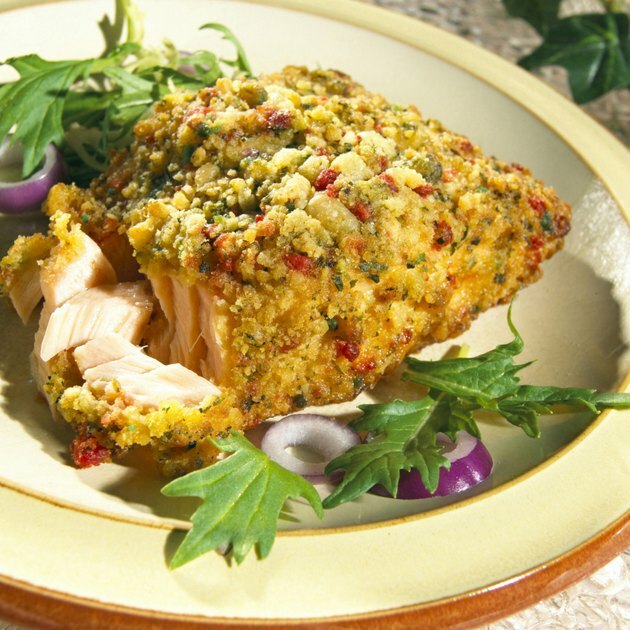 Bake the salmon in an oven preheated to 400 degrees Fahrenheit for about eight minutes. Check the fish for doneness and bake for an additional two minutes if needed. Create a poaching liquid of your favorite ingredients such as lemon juice, vinegar or white wine. You also can add a pat of butter or a dash of your cooking oil of choice to the liquid. Season the salmon with salt and pepper to taste and place it in a microwave-safe dish. For a 1-inch-thick piece of salmon, pour about a 1/2 inch of liquid in the dish. Cover the dish with plastic wrap and make a slit the top. Set your microwave oven to "high heat" and poach the salmon for about four minutes. Check it for doneness and microwave for an additional minute as necessary. Grill your salmon on cedar planks -- which you can buy at a kitchen store or online -- for an unusual flavor boost. The Kitchn website suggests soaking the cedar planks for up to two hours in wine or cider rather than water, for additional flavor. Then coat the fish with a blend of lemon juice, fresh herbs and cooking oil. Heat your grill to around 350 F and lay the planks on it. Place the salmon on the planks and let it cook for around 12 to 15 minutes or until done.